Floating stones are designed and sculptured by Richard Williamson in Perth Western Australia. 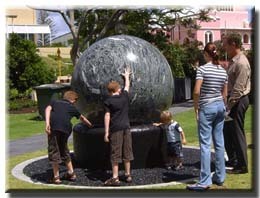 The spheres, made from selected Australian rock and semi precious stones, float and rotate on a microfilm of water and can weigh over three tonnes. The rock sphere fits in a rotation cup within a base stone that corresponds exactly to the sphere's dimensions. A low pressure pump gently lifts the sphere allowing it to rotate on water. The balanced sphere rotates continuously. Gentle hand pressure will interrupt the rotation and allow even a small child to control its direction. Each sphere takes up to three months to sculpt and has to be perfectly symmetrical, polished and balanced to rotate in every direction. The spheres are uniquely innovative and ideal for shopping malls, parks, entrances to institutional buildings, museums, and private residences. The spheres can be made to order out of suitable rock or semi precious stone to the size required. Richard Williamson is a lapidary artist. A lapidary artist is an artist whose medium is stone. By sculpting the stone, a unique piece of art is created. At Floating Stones, the stone is first mined, then cut and polished to create spectacular pieces of artwork. When commissioning a piece from Floating Stones, you are truly getting an original piece of artwork, showcasing the natural beauty of the unique stones found only in Australia. I am a stonemason and gemmologist. I was born in Kenya, studied in the UK, and have been an Australian resident since 1969. I began an agricultural career, but after being called up for National Service, my interests changed, and I started a career in Lapidary and Gemmology in the 1970s.